The Spin Box Delegate example shows how to create an editor for a custom delegate in the model/view framework by reusing a standard Qt editor widget. The delegate class declares only those functions that are needed to create an editor widget, display it at the correct location in a view, and communicate with a model. Custom delegates can also provide their own painting code by reimplementing the paintEvent() function. Since the delegate is a subclass of QItemDelegate, the data it retrieves from the model is displayed in a default style, and we do not need to provide a custom paintEvent(). 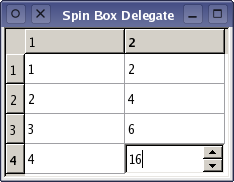 The table view is informed about the delegate, and will use it to display each of the items. Since the delegate is a subclass of QItemDelegate, each cell in the table will be rendered using standard painting operations.